Most pest species are yellow; they can vary to a rather dark brown, from 3–5 mm long. These are monomorphic species having workers all the same size. Maxillary palpi are long and five-segmented. Colonies usually found in soil. They feed on sweet materials, attend aphids for honeydew, and become a general annoyance factor around homes. Reproductive swarming usually occurs late summer to early autumn. This widely distributed genus contains several species of pest status. Moisture ants are an easily recognized group of social insects. The workers are wingless, all possess elbowed antennae and all have a petiole (narrow constriction) of one or two segments between the thorax and the abdomen. Most ant colonies are started by a single, inseminated female or queen. From this single individual colonies can grow to contain anywhere from several hundred to several thousand individuals. Ants produce reproductive forms usually at one time of the year (spring or fall, depending on species and colony disposition). Colony activity at the time of reproductive swarming is high, with winged males and queens and workers in a very active state. The queen and males fly from the colony and mate. Shortly after mating, the male dies. The inseminated queen then builds a small nest, lays a few eggs, and nurtures the developing larvae that soon hatch. When adult workers appear, they take over the function of caring for the queen and larvae, building the nest and bringing in food for the colony. Colonies may persist for 20 years or more. 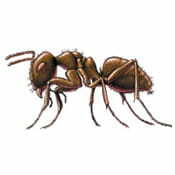 The ants occur throughout the state of Washington and are the most common moisture ants in home structures. These ants frequently appear associated with rotting wood in houses. While several species may bring moisture into the wood structure to increase damage, the colony initially started in wood in an advanced stage of decay. Do not consider these ants a structural pest as the problem invariably existed before the colony was established. Remove the decayed wood and replace it with sound material while correcting the condition that led to the decayed wood in the first place. These ants will construct galleries from the rotting wood within which they feed. Do not confuse these galleries with the more linear tube-like tunnels made by subterranean termites. ***It’s usually recommended to repair/replace the damaged wood and fix the moisture issues, in lieu of insecticide treatments.